We are asked about Canine Oral Papillomas (Oral warts/COPV) every week. And, our success with this ugly and challenging problem has been remarkable. Generally, people follow the advice of their veterinarians and wait the 3-6 months for it to hopefully go away. 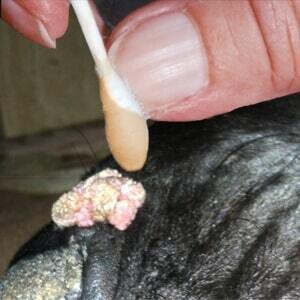 That’s problematic for most pet owners who are seeking a quick and simple answer to their problem and are concerned about how fast warts can grow or spread. Many people have had them surgically removed only to see the return again. 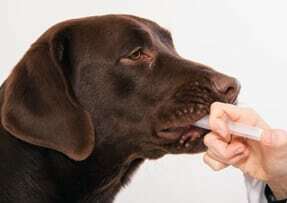 As an alternative, NZYMES® has created a sensible, easy to use and naturally effective program for helping customers to find resolution and restore oral health for their canine friends. And, many NZYMES® customers have taken the trouble to document their success stories while following our “Papilloma Support Program”, including text and photos which demonstrate successful results in generally about 1-3 weeks. 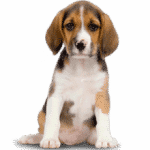 However, each case is different based on the level of immune deficiency within the pet. The NZYMES® Papilloma Support Program is backed by our 120-Day Money-Back Guarantee! Our Papilloma Support Kits provide the primary essential elements to address this unsightly issue for your pet. We’ve included a FREE bottle of our Antioxidant Treats with the purchase of this system to provide an extra nutritional boost, along with an Oral Syringe for your convenience. Follow these instructions for the quickest results. When papillomas are present, be assured that the pet’s immune system is in a lowered state. 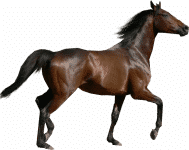 So we increase the regular daily INTERNAL use of the Ox-E-Drops to 3 TIMES DAILY which helps reinforce the support for the pet’s immune system. 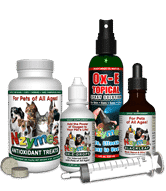 Follow the label, mix the drops from the Ox-E-Drops Concentrate in a syringe with enough water to dilute it properly (3-4 cc’s) and squirt this mixture along the pets teeth-line so they can lick it up slowly. Avoid squirting down the throat which can cause choking. 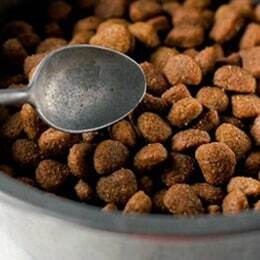 The Ox-E-Drops can also be added to a teaspoon of water, then spilled over the pet’s food. However, with warts issues, the syringe method works the best to assure the proper amount is given 3 times each day. Usage Amount: Mix 1 drop per 20 lbs. of body weight with a teaspoon of water. For smaller pets use a minimum of 2 drops, 3 times daily. Also, add 2-4 drops to the water dish each time it’s filled. 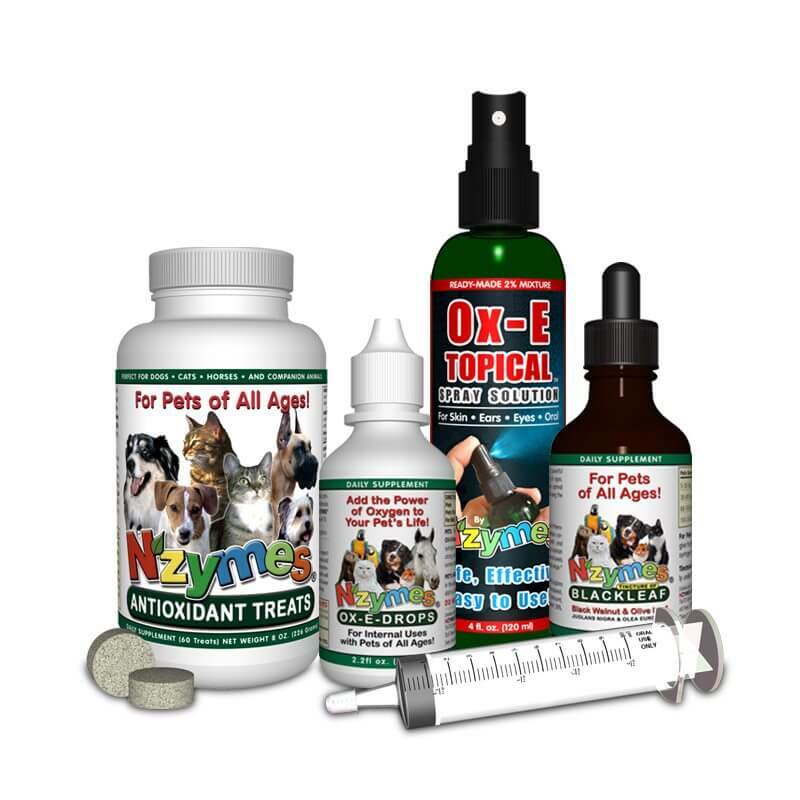 Ox-E-Topical is a Ready-Made 2% solution of our Ox-E-Drops and Special Ionized water. The slender, 4oz bottle is ideal since it can be easily maneuvered in and around the areas of the mouth and face. It produces a fine mist which is ideal to help saturate the affected areas with little waste. The bottle itself can be refilled, directions on refilling are on the label. For more general instruction on how to make this solution, click HERE. Apply or Spray the Topical Solution to all the affected areas a minimum of 3 to 4 times daily. Spray the entire inside of the mouth or anywhere a growth may be visible. These drops should also be used 3 times daily. Following the weight chart on the side of the bottle, mix the Black-Leaf Drops with a teaspoon of water, and give orally with an eyedropper or syringe, as described above. The drops can also be added directly to the food. Saturate a Q-Tip with the Black-Leaf drops and apply directly to warts. It is best to use the Ox-E-Drops 2% Topical Solution FIRST, then follow directly with the Black-Leaf. The NZYMES® Antioxidant Treats provide natural superfood nutrition which helps support a stronger immune system. Enhanced nutritional support, like that provided by the Treats, can help get your pet back on the road to recovery sooner. This is why we felt so strongly about adding 1 Complimentary Bottle to this special Papilloma Support Kit. Thru the years, people have been using our Antioxidant Treats for Pets for a variety of reasons, making them our top seller. After you are finished with this program, we suggest the regular daily use of the products in the NZYMES® 3 PAK KITS! These 3 powerful products help support a wide variety of your pets nutritional needs and helps them maintain a stronger immune system.